Bringing back nostalgic foods can be a mixed bag depending on when and under what conditions they were invented (the polarizing Necco wafer, for example). But drawing from the kernels of wisdom that these flavor-memories ignite can be a brilliant way to innovate a new, tastier future that pays homage to edible history. In Israel, some mixologists have done exactly that with their modernized version of gazoz, a flavored fizzy water ideal for slaking summer thirst. In the early 20th century, a glass of gazoz was simply soda water mixed with sweet fruit syrup—refreshing but not so enticing as to withstand the arrival and popularity of brand-name sodas and the SodaStream (whose headquarters is now located in Israel). 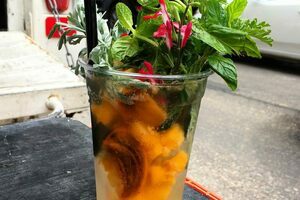 But recently, Benny Briga at Cafe Levinsky 41 in Tel Aviv helped revive and update the nearly-forgotten mixture, keeping the soda, ditching the phosphorescent artificial additions, and injecting the drink with fresh flavors made from local and seasonal ingredients. Depending on the season, contemporary gazoz might include a cocktail of fruit, herbs, homemade tinctures, and spices. Makers macerate and partly ferment the likes of berries, apples, pomelos, or clementines, and marry them with vinegar to make a mouth-watering shrub. These and other flavorings, such as ginger, cardamom, chili pepper, and juniper, form the base of the drink, showing off an array of organic pigments through the added soda water. Perhaps the most attractive additions to today’s gazoz are the fresh herbs placed atop the mixture, erupting from the glass like a bouquet. Layer upon layer of ingredients can be added to create complex flavors that hardly resemble their ancestral soda. But to the nostalgic, even the most extravagantly flavored gazoz still provides a satisfying sip of the past.